I liked this spherical robot mostly because it's a pretty cool DIY project by Nils Völker done with a Lego Mindstorms NXT robot kit. It is not autonomous; the user controls it via Bluetooth. It uses the same form of locomotion as some other robots you may already know about; see the videos in these articles for more information and diagrams - Rotundus And Rover: Spherical Robotic And Fictional Guardians, Inflatable Spherical Robots May Explore Mars and OrbSwarm Autonomous Spherical Robots. I also liked this somewhat unique spherical robot - Jollbot Robot Ball Jumps, Bounces And Rolls, which has a pretty good video of Jollbot in action. 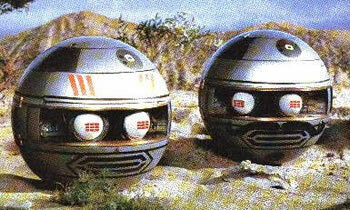 SF fans (as well as fans of supermacromation) remember the early 1980's series The Terrahawks, which had spherical robots called Zeroids were used to fight the evil witch-like alien Zelda.